Just this morning, as I was browsing through the net some visual inspirations to fuel my hump day, I came across this genius campaign made by a Dutch outdoor advertising company, Interbest. 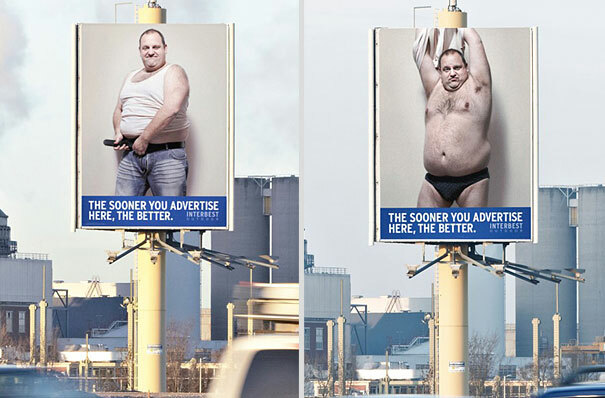 They used a male stripper to build awareness of their billboard visibility in a campaign that has won Gold at the 2011 Clio Awards. 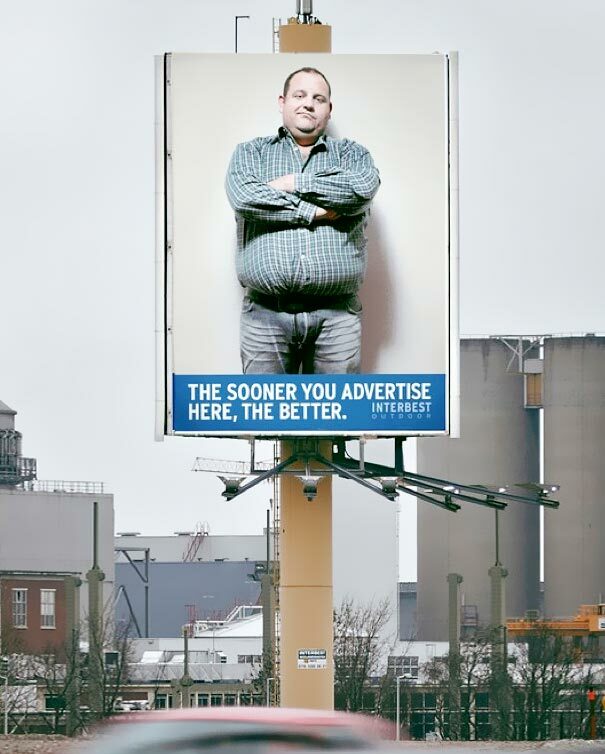 The campaign involved a progression of billboards each showing the overweight man in fewer clothes with the text: “The sooner you advertise here, the better”. Just in time, the billboard is taken up with an advertisement for Radio 2, BBC’s national radio station. The campaign is a development of an earlier series of billboards which won a Silver Outdoor Lion at Cannes in 2010. Credits to the genius brains behind this campaign, Y&R Not Just Film’s team, art director Marq Strooy, copywriter Robin Zuiderveld, production manager Tilly van Duivenbooden, photographer Morad Bouchakour, account manager Jacqueline Loomans, and advertiser’s supervisor Meindert Van Den Heuvel. Leave a comment	| tags: art, artist, client, Creativity, Design, freelance, Humor, inspiration, life, motivation, Photoshop, reality, tips, Work	| posted in Art Attack!, Everyday, Oh Life! From a conventional management perspective, it probably sounds like common sense. But to anyone who understands the nature of creativity and what motivates creative people, it’s a recipe for disaster. Rewarding people for hard work is a great thing to do, but it’s no guarantee of loyalty – and certainly no guarantee of creativity. And using rewards as an incentive – or even a threat – has been proven not to work when it comes to complex, challenging, creative work. When you’re focused on a reward, you’re not focused on the work itself. And as any creative will tell you, doing outstanding creative work – whether solving a technical problem or creating a work of art – requires 100% focus on the task in hand, to the point of obsession. You have to love what you do. Of course companies need to pay people well. If they don’t, compensation becomes a bone of contention, and a distraction from their work. But if you really want outstanding creative performance, you need people to focus on intrinsic motivations – factors inherent in the work itself. Things like challenge, interest, learning, meaning, freedom, and creative flow. They are what really motivates creative people – and the research demonstrates a strong link between levels of intrinsic motivation and creativity. In The Rise of the Creative Class, Richard Florida discusses the results of an Information Week survey of 20,000 IT workers, who were asked “What matters most to you about your job?”. Florida points out that not only did money (an extrinsic motivation) rank only fourth, behind three different types of intrinsic motivation, but that “nine of the ten highly valued job factors are intrinsic”. And remember, it was a survey of IT workers, who might be expected to take a more hard-nosed approach to motivation than more artistic types. Money buys you people’s time. It should also guarantee you basic professional competence. But you don’t get outstanding creativity by simply offering more money. You get mercenaries. If you want real creativity – the magic ingredient X that sets the product apart – you need to inspire it, by showing them what makes the work fascinating, challenging, meaningful, and fun. And you need to give them freedom to do it their way, rather than micro-managing every step. If you’re a creative, you probably experience a tension between following your own creative inclinations vs giving the market (your boss, clients, or customers) what it wants. Spend too much time on your own pet projects and you risk disappointing the VIPs in your working life. But if you spend too much time on well-paid work that doesn’t inspire you, your creativity will fade away. So it’s vital to strike a balance between intrinsic and extrinsic motivations in the work you take on. Sometimes you need to take on a less glamorous project or job to pay the bills – if so, make time for more interesting creative pursuits, in the evenings and weekends if need be. This will keep your creative spark alive and make you less resentful of the grunt work. And challenge yourself to take a creative approach to any job you take on, no matter how unpromising the brief. It could be as mundane as packaging elastic bands, but if you keep coming up with original and valuable solutions, you’ll earn a reputation for priceless creativity. What Motivates You and Your Team? 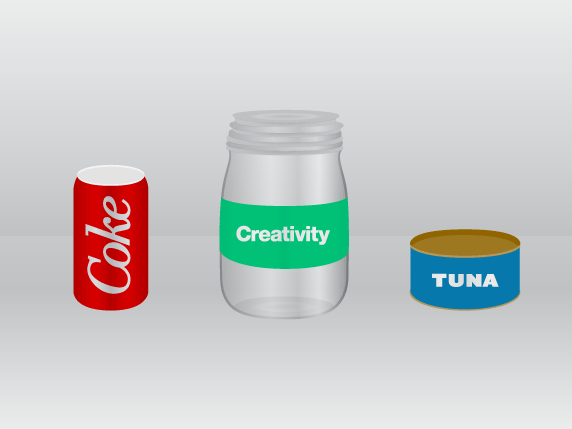 Think about the best piece of creative work you ever did – what motivated you to do it? Any tips on motivating and inspiring creative employees? Leave a comment	| tags: art, Blog, Business, Creative work, Creativity, Employment, life, motivation, tips, Work	| posted in Art Attack!, ARTspirations, Oh Life! It’s a Friday! Well, if you had not been struck by Friday Sickness that bad that you made it to your office, congratulations! Here’s an Internet High Five! I hope this wouldn’t be another drag day for you, well in case, maybe this activity just might help a bit. 1. Kill a few Flies. 2. Put them in the sun to dry for one hour. 3. Once they are dry, pick a pencil and paper… Let your imagination flow. These ads aren’t new. But they never fail to impress. 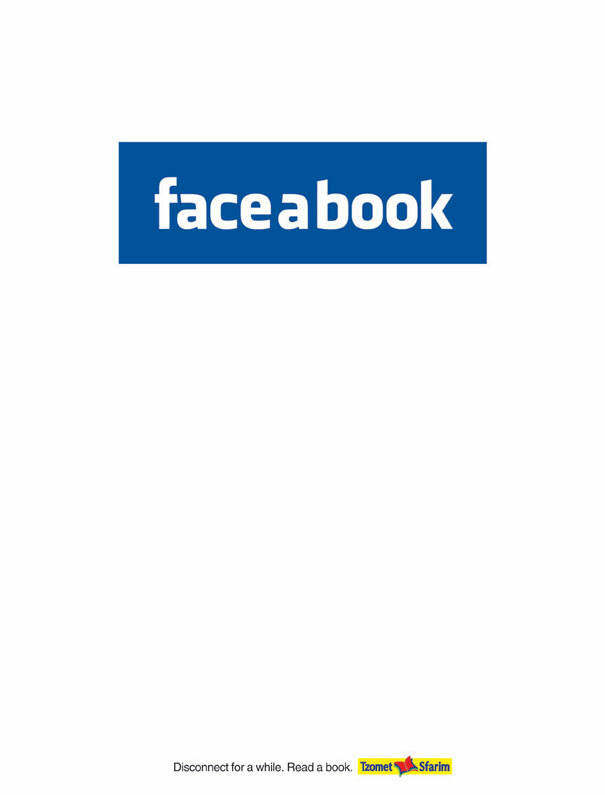 Leave a comment	| tags: advertisement, Books, Creativity, Facebook, Reading	| posted in Oh Life! Because billboard ads are so good, and these guys are so creative, here is another set of billboards-gone-amazing. I’m becoming a fan of these ads lately. 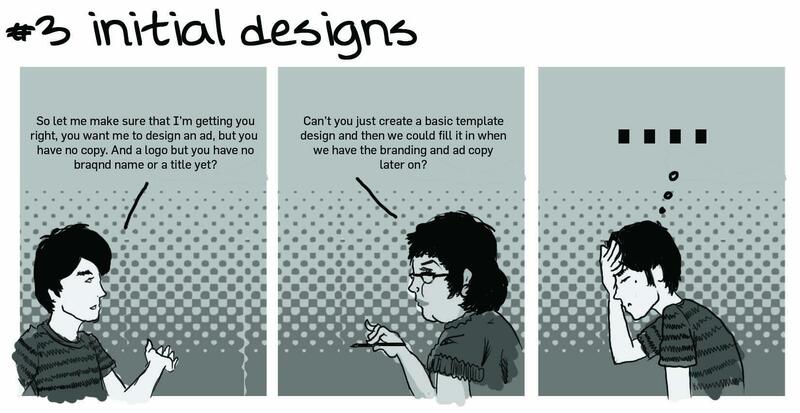 Click here to see more creative billboard samples. Some makes sense, but don’t count on it!